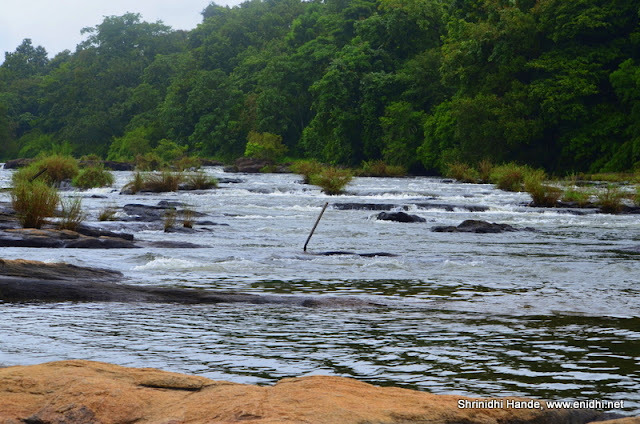 Athirapally, located in Kerala- Tamil Nadu border (about 200kms from Coimbatore) was on my wishlist for long time. 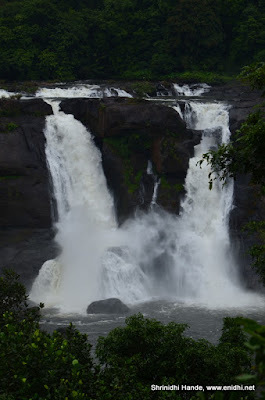 Athirapally is often quoted as India’s Niagra. Mid August I finally drove there. The falls is majestic but felt it was not at its best. 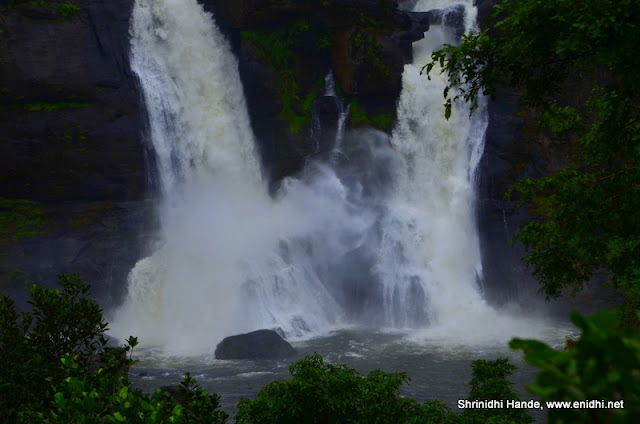 This post shares photos of Athirapally falls, details on how to reach there and related information. We watched the falls from 3 different spots. I think below one, visible from the main road without having to buy any tickets, is the best of them. 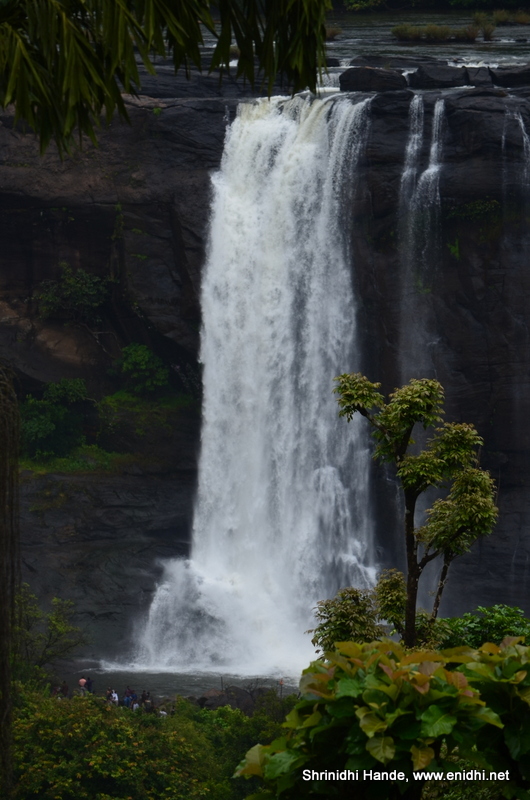 The other view is from the Chalakudy river bed, where in drops about 24 meters off a cliff. This is the ticketed area and barricades are in place to prevent people from going too close. This spot gives great vistas of the valley and the river and also gives an opportunity to get into river water a bit- for those keen on getting wet. Life guard was on duty, which is good thing, but he was an old man, blowing whistle and asking people to go back. Upstream river is pretty calm and doesn't give any hint of the sudden drop ahead. 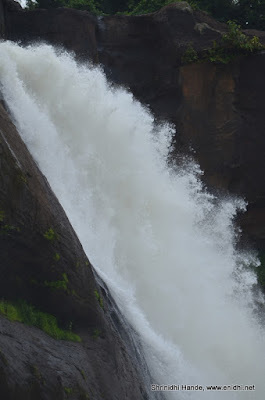 Congress leader Digvijay Singh and his platoon visited the falls on the day of our visit. His vehicles got priority parking right next to entry gate. We lesser fortunate folks had to walk a km from parking spot. 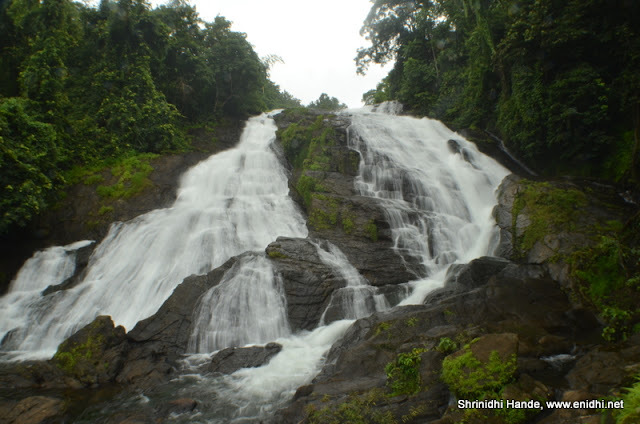 How to reach Athirapally waterfalls? Because Athirapally is in Kerala and Cochin is the nearest airport, most tourists reach Cochin and then reach Athirapally by road. That would be convenient if you would like to explore few other places in and around Kochi as well – such as houseboats in Alleppy, Kochi city, Kumarakon etc. 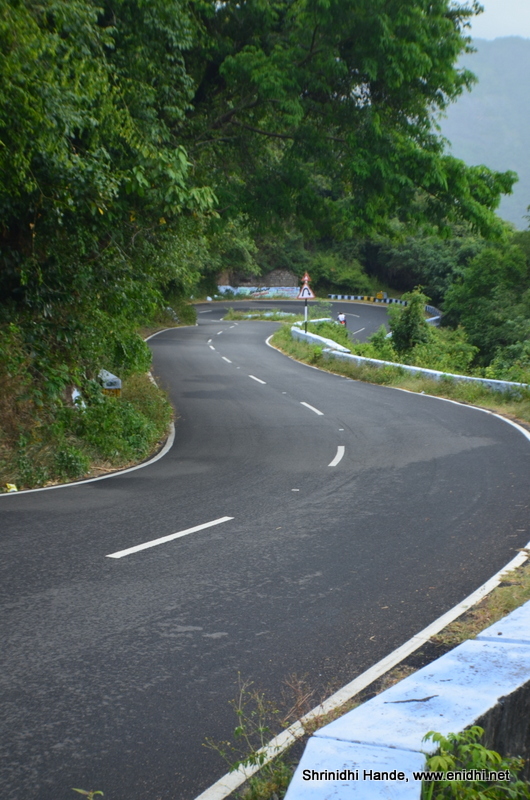 Alternate route will be from Valparai. 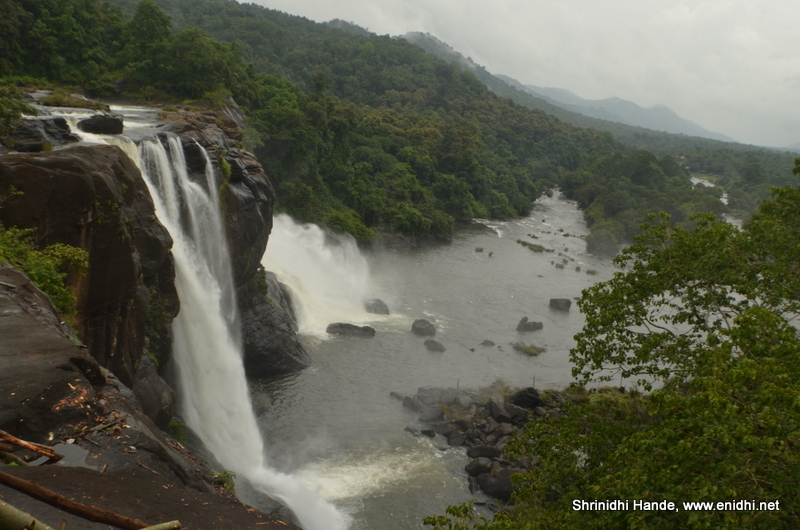 I took a train to Coimbatore, rented a car from Kovai, drove to Valparai, spent a night and then drove further to Athirappally via Sholeyar dam. Athirapally is about 80 kms from Valparai. The drive is great, passing through tea mountains of Valparai and dense evergreen forest of western ghats. Road condition is good. With occasional rains, cool breeze and views, I enjoyed the drive. 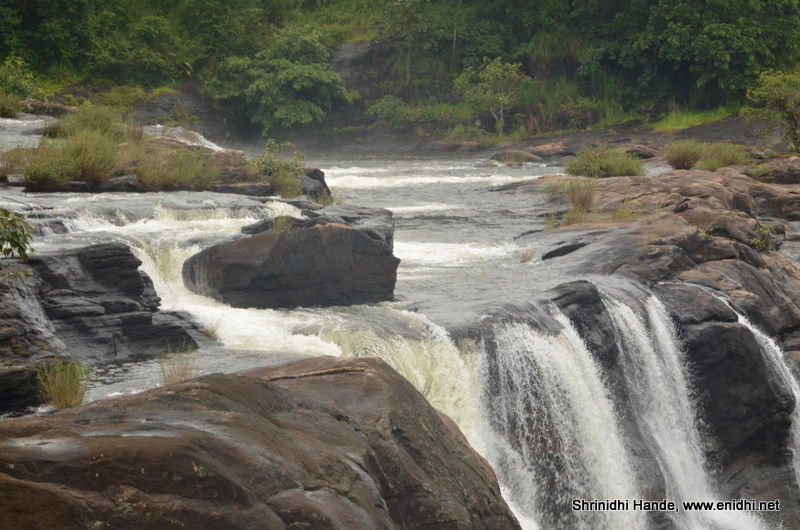 There are several home stays around Athirapally should you wish to stay closer. Might be more convenient to do a day trip from bigger cities. Decide based on your preference/convenience. 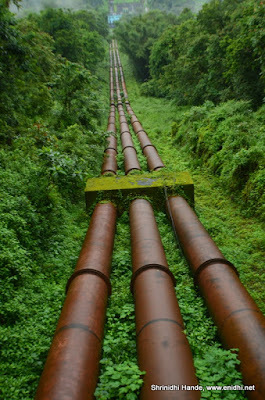 A few road side hotels and shops are available near Athirapally. If you are not comfortable with them, then pack your food. 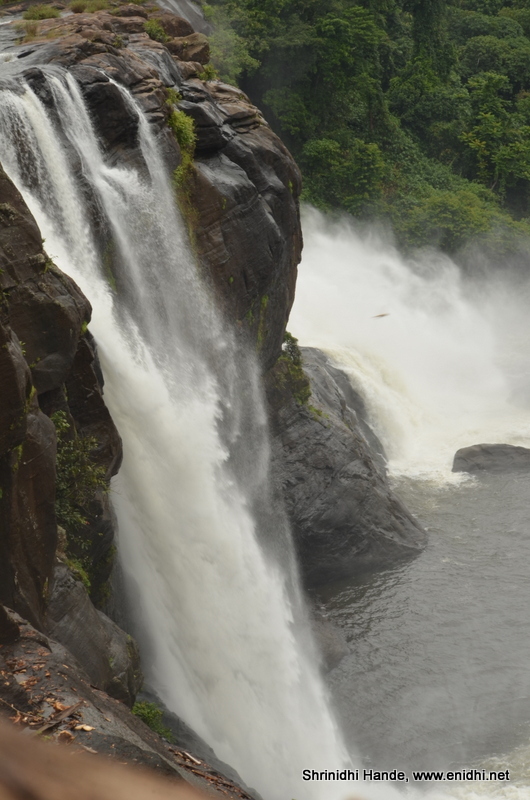 Overall, the Athirapally falls is no doubt great, but I feel Hogenakkal on Karnataka Tamil Nadu border can give you better experience all through the year. Wow. Stunning views and I am sure it would be an awesome experience to sit around and watch these wonders of nature. Lovely pics. Am sure it would swell by September. Lovely captures. Wow. Stunning shots. Loved the post. Thank you for sharing. Nice shots of a beautiful place. amazing scenes you have captured. TFS. There were a few typos which I have corrected now. @Ramdass Naik- you can check on Mylescars.com website- about Rs 2400 a day on average for etios, weekday & weekend mix. Diesel extra. If you can get sleeper class tickets, that will cost less than toll amount you have to pay between Chennai and Coimbatore. Anyday it is better to rent at Coimbatore than drive from Chennai all the way.